Is it a book...or an electronic tablet? From bestselling author and Caldecott honoree Patrick McDonnell comes a timely tale in a tablet-shaped package that's perfect for today's legions of device-obsessed, digital-savvy children. Here is a hilarious (and heartfelt) reminder of how technology can take us backward...all the way to the times of prehistoric man! 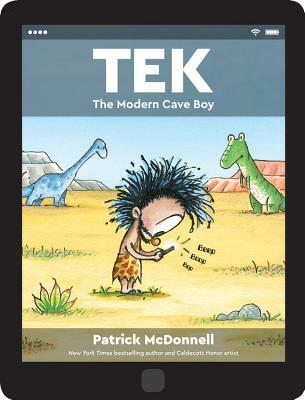 Tek is a cave boy in love with tech: his tablet, videogames, phone, and TV keep him deep in his cave, glued to his devices, day in and day out. He never sees his friends or family anymore--and his ability to communicate has devolved to just one word: "UGH!" Can anyone in the village convince Tek to unplug and come outside into the big, beautiful world? A distinctive, digitally-inspired package and design cleverly evokes the experience of using an electronic device that eventually shuts down...and after a magic page turn, Tek reconnects with the real world. Patrick McDonnell is the creator of Thank You and Good Night, A Perfectly Messed-Up Story, The Monsters' Monster, and Me...Jane, a Caldecott Honor Book. He is also the creator of the internationally syndicated comic strip Mutts, which inspired his picture books The Gift of Nothing, Hug Time, and others. He lives in New Jersey. *"McDonnell (Thank You and Goodnight) plays fast and loose with the historical record in this playful cautionary tale...ever-cute creatures deliver the story's tech-addiction message with a grin, and clever references abound." "McDonnell blends the prehistoric with the present to send a clever reminder to young readers that beyond their electronic realm there is a world waiting to be explored.... Good, snarky fun for parents and kids." "The style and whimsy of the images are...charming." *"This picture book's satisfyingly soft illustrations...feel just right for its plush language and darling characters and content....Small listeners will nestle deep under their covers feeling thankful for tender books that make bedtime a pleasure."